If you want to teach children how to code, then buying them a product like the Raspberry Pi makes a lot of sense. It’s versatile, and cheap enough that if they break it, buying a replacement shouldn’t be too big a deal. Not every child is going to want to learn how to program a Pi though -- the appeal of it won’t necessary be apparent to a kid who just wants to play. This is where SPRK+ comes in. The Sphero robot can be driven using an app, and then -- when the appeal of that wears off -- programmed in a choice of ways. Like many Sphero products, the SPRK+ is a weighted ball with a motor inside that rolls in whatever direction you want it to. It includes a gyroscope, accelerometer, and programmable LED lights, with built-in freefall and collision detection, and all packaged inside a scratch resistant, waterproof shell. Charging the SPRK+ is just a matter of connecting the base to a USB port and then dropping the ball on top of it. SPRK+ will light up and change color, and then the base will flash to show it’s charging. A full charge will give you around 60 minutes of play time. As well as SPRK+ itself and the charging base and USB cable, the box comes with some Maze Tape that you can put on the floor for the robot to follow, a cardboard protractor, and a selection of stickers. Everything is controlled using the free Sphero Edu app. Available for iOS and Android, this is packed full of options, and connecting it to the SPRK+ is just a matter of selecting that particular robot from the list of options (which also includes Sphero 2.0, Sphero Mini, and BB-8) and tapping your phone against the ball. Once it’s connected, the robot will light up and be ready to use. It employs Bluetooth for the connection, and has around a 30m range. 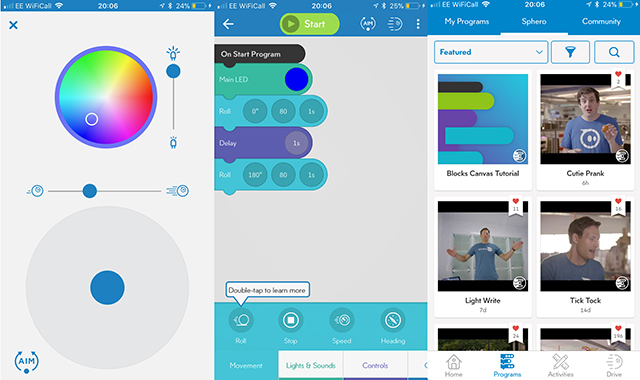 The app offers four options along the top -- Feed, 3D Models, Profile, and Settings -- and another four along the bottom -- Home, Programs, Activities, and Drive. 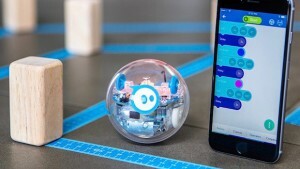 Feed contains a stream of new and recently posted programs, while 3D Models lets you explore inside Sphero and Ollie (the company’s other robot form). Profile is where you sign up for a Sphero Edu Account so you can share programs and track activity. Settings is home to lots of useful information, and you can force a firmware update and enable interface sounds in the programming canvases from here too. It’s the menu strip at the bottom that’s of most interest though. Programs is where -- unsurprisingly -- you can program SPRK+ and access past creations. There are three program types -- Draw (you draw a shape for the ball to follow), Blocks (you use visual blocks to construct your program) and Text (use the C-based language). You can also view featured programs, and community creations. Creating a program from blocks is just a matter of perusing the action you want from the selection at the bottom. Categories include Movement, Lights & Sounds, Controls, Operators, Comparators, Sensors, Events, Variables and Functions. Drag an action to the canvas, and then stack up other blocks as required. The Activities section is for projects you’re working on (you need to sign in for this) and Drive is where you can directly control SPRK+. A color wheel at the top lets you change the LED color, as well as its brightness. Underneath this is a slider which lets you adjust the speed that the robot rolls at. It can move at a maximum of 4MPH which is actually faster than you might expect. If you find controlling it at this speed too tricky, reducing it will make the ball more manageable. Underneath the slider is a touchpad that you use to drive SPRK+. Before you start however, you’ll firstly need to use the Aim option to make sure the robot is facing in the right direction. Just hold that button down, and then move your finger around the circle that appears until the blue light is facing you. I’ve been using SPRK+ for quite some time, and it’s brilliant. At its most basic, you can just drive it around, scaring your cats and entertaining your dogs, but when you want to do more -- either making use of someone else’s programs, or creating your own -- it’s easy to do so. My six year old daughter loves it, and has already constructed a number of pretty advanced programs without help. 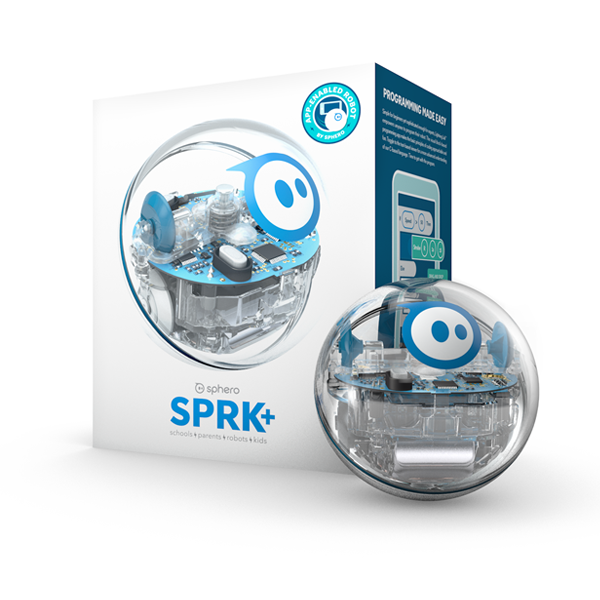 SPRK+ is available to buy from Wellbots in the US for $129.99 with free shipping. If you haven’t shopped with the company before, you can get $20 off your first order using the code NEW20.